When you see Paul Ruffin anywhere on the SHSU campus or on his walk to and from his home, one of the last adjectives that might spring to mind to describe him is distinguished. In the summer he wears shorts, a Texas Review Press t-shirt and cap, and trail boots, and in the winter he substitutes jeans for his shorts and sometimes wears a denim jacket. But the fact is that he is officially distinguished, having been proclaimed a Regents Distinguished Professor of English by the Texas State University Board of Regents last November. 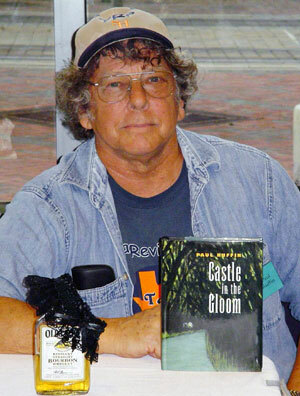 Author of two novels, two collections of short stories, and five books of poetry, with his work appearing in journals, anthologies, and textbooks all across the country, Ruffin was recently a featured author at the Southern Festival of Books in Memphis, where he read from and signed copies of his new novel, "Castle in the Gloom," released in September by University Press of Mississippi. (He was dressed the same: jeans and trail boots, TRP t-shirt and cap: “Gotta advertise the press, you know, but the half pint of Old Crow and black garter that sat on my signing table were merely props to promote the book. I didn’t break the seal until later that afternoon.”) He has also been a featured author in the past few years at the Texas Book Festival, the Eudora Welty Symposium, and the Tennessee Williams Symposium. "Castle in the Gloom" is much more lighthearted, with a great deal of humor in the exchanges between his two major characters, Tommy and Annie, an estranged couple who find themselves in a lot of trouble while on their way from Shreveport to Houston. When asked about the origin of the novel, Ruffin explained that it grew out of a short story from his first collection, "The Man Who Would Be God." “Every time a woman mentioned her favorite story in that collection, without fail it was ‘The Beast Within,’ the story of a couple who get more or less kidnapped and imprisoned in the storeroom of an old country general store by a crazy old woman who lives there. I never could quite figure out why that particular story would always be the favorite of women, but the more I thought about the couple, the more fascinated I became with them. In Chapter Three Ruffin examines the nature of East Texas and its inhabitants through a distillation of Tommy’s thoughts as he drives along, headed south toward the very strange and frightful night that awaits the two of them. “ I’ve always liked writing about couples,” he explained while going over his many stories in which a man and woman share leading roles. “'Pompeii Man' is about a couple who get in trouble in New Orleans when the foolish husband lets a sexual fantasy go a little too far. Ruffin is also working on a novel called "The Gravel Pit War," which is set in Mississippi during the embryonic stages of the Civil Rights Movement. His next book to be published, "Here’s to Noah, Bless His Ark and Other Musings," a collection of his newspaper columns, will be out in the spring of 2005. He also has two other books currently being considered by university presses, "Growing Up in Mississippi Poor and White But Not Quite Trash" and "The Segovia Chronicles," and he is revising his third book of stories, "Jesus in the Mist," for publication. Ruffin teaches creative writing and an editing and publishing course at SHSU, where he edits The Texas Review and directs Texas Review Press. Copies of "Castle in the Gloom" are on sale in area bookstores, including Hastings in Huntsville and Conroe (special-order only in the Conroe store), and the Woodlands Barnes and Noble. It may also be purchased on numerous web sites.